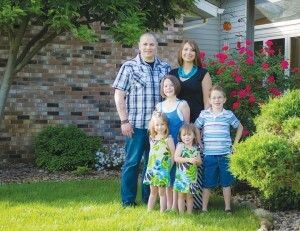 Goshen-area artist Andy Jewett is pictured with his family. Sunday’s Goshen, Ind., News includes a story about Andy Jewett, the tech and media director for Grace Community Church, a Grace Brethren congregation in Goshen (Jim Brown, pastor). A portion of the story appears below. Click here to read the complete story. GOSHEN — Andy Jewett says faith and family are a huge part of his life. He’s the tech and media director for Grace Community Church in Goshen. He had volunteered with the worship team at the church when what is now his current position opened up in May of 2012.